Can anyone tell me what the dimensions of a CD-22 v-berth are? At the widest part of the berth, narrowest, and down the centerline? The width measurements will be greater with cushions installed because the hull flares outwards as you go up from the flat floor. Thanks! I'm ordering Hypervent, to help prevent condensation under the mattress. Andy, Sorry I missed your ??? asking about the hypervent. I got called away last night and didn't get to finish. I will be interested in your experience with it. We have used the hypervent under the v-berth cushions for years. It have worked very well. We have very little condensation in Meander. 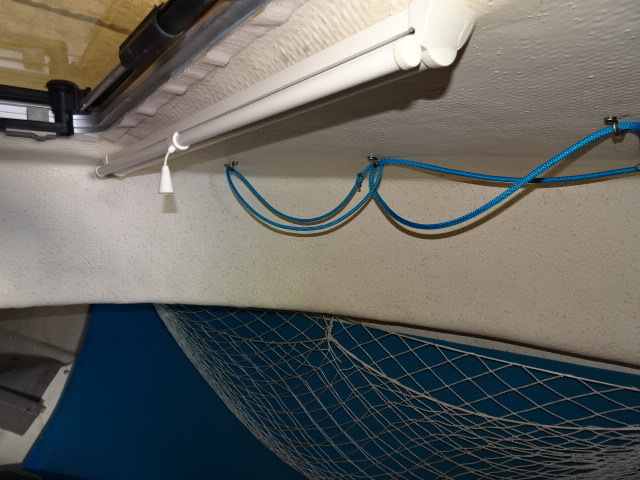 I also installed v-berth opening port lights which probably help a lot with the air exchange. We have put the closed cell foam back packing pads under the bunk cushions. We also have the small rectangular ports in the sides of the trunk cabin over the V berth--Plus completely opening up the port side of the V bunk...a bit more than Ron's. Also we have a 3" memory foam topper on over the cushions. This is another layer of insulation, which also keeps body heat from the cushions. I agree all of these help with the condensation under the bunk cushions. The hypervent will be a good addition. Ron, I have looked at the Hypervent and wondered if the bottom side (which seemed more course, stiff or rough) leaves any marks or wear on the v-birth gel coat. I have been using a pair of yoga pads (1/2 inch) one under and one beside me against the hull. Sleep with the hatch open about 1" and the center window open. No moisture issues. Ron, I have have been using a pair of yoga pads (1/2 inch) one under and one beside me against the hull. Sleep with the hatch open about 1" and the center window open. No moisture issues. Harvey, were you condensation free during your rainy trip to the Broughtons? Really hard to tell Everything was wet, but much of that was from wet clothes going into the cabin. Things were damp everywhere, not just in the birth. I did run the Wallas a few times to dry things out. I don't think I had excessive moisture under the mattress. There were times that I only had the forward hatch open a half inch or so, but I usually had the center window open to the first latch, but again sometimes half that if it was blowy. Harvey I put the fabric side down. I have not noticed any noticeable wear caused by the hypervent. I do think it works better than some of the alternatives because it allows movement of air. And, we probably use the Wallas heaters ( cooker and furnace) more than most. Whenever its damp or cool, we have either one or the other running. The combination of using the heat, ventilation and having insulated the hull with mascoat paint seems to make Meander a pretty dry boat, even during wet conditions. Colby, the yoga mats work nice to lay against the side wall, and go from the bottom of the mattress, up above where your sleeping bag and blankets will touch the hull insides. I use the half inch thick mats and works great. Colby, I got mine off the shelf at WalMart. They were on the off season sale rack for about $6.00 or I probably would not have picked them up. I used one for a floor in my inflatable to make it less slippery. Needed a place to store it when the inflatable was up side down on the rack. (Works as another double duty item on board. The image should give you some idea of what they look like in the 22. We didn't have any moisture running down the sides on the bedding but the lowest temps we dealt with were only in the mid 30's. On the 25 we have the pads going up to under the shelf which is for luggage stowage and is about half way up the side of the hull. Again, no moisture issues.